Danny Kent hailed his stunning maiden Grand Prix victory in Japan yesterday as ‘amazing’ after he triumphed at the end of a dramatic Moto3 clash. The British teenager went from fifth to first on the final lap after Luis Salom wiped out Jonas Folger with a reckless overtaking move at the first corner. 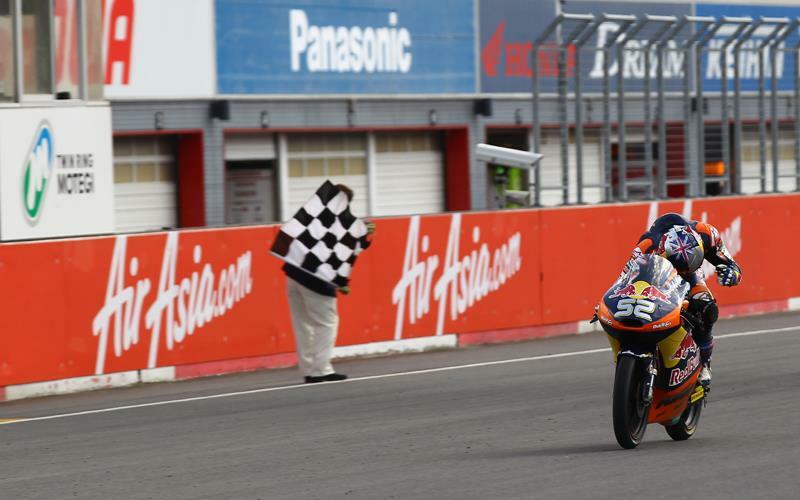 That put the 18-year-old third and he then passed Alessandro Tonucci to set his sights on Red Bull KTM teammate Sandro Cortese, who only needed a podium to clinch the title with Salom out and Maverick Vinales only fourth at that stage. With no team orders in place though, Kent attacked in the hard braking zone for the penultimate corner and made a clean move on Cortese, who then crashed after tangling with Tonucci. The German remounted to finish sixth, yet despite increasing his lead in the world championship to a commanding 56-points with just three races remaining, he was furious that Kent had attacked so late. Cortese remonstrated with Kent on the slowing down lap but with no team orders in place, the Brit said he felt he had every right to try and secure his career first victory. Most in the paddock agreed with Casey Stoner, Valentino Rossi and Cal Crutchlow all saying that Kent did absolutely nothing wrong and that his overtake had not been a dirty one and he had given Cortese ample room. Speaking exclusively to MCN, Kent said: “It was amazing. I was so happy and then Sandro came past me waving his fists and going all crazy and I didn’t realise he’d crashed. "That made my mood drop a bit but I saw the replay and I have a clear conscious and know I didn’t do anything wrong. "I knew coming into the corner if I could stay in his slipstream that I could have a go. I just needed to get a good exit at the corner before and I managed to do that. "I was a bit worried going into the corner because I hadn’t been as strong on the brakes compared to Sandro and I knew I had to brake a little bit extra and a little bit harder. Kent’s victory capped off a memorable week. He had scored his maiden pole position less than 24 hours before his brilliant victory and his breakthrough result came hot on the heels of him signing a two-year deal to replace Bradley Smith in the Tech 3 Racing Moto2 team just before he flew to the Far East. And Kent said knowing his future was sorted for 2013, he had arrived in Japan with no distractions occupying his mind. For more from Kent on his famous victory, see the October 17 issue of MCN.